Happy Friday, guys – we’ve made it through the week! It’s been a mad few days for me – I’ve just taken on a new title at work which means I’ve spent most of the week running around several buildings in the area having meetings with people. I’ve worked for the company for 2 years and this week spent 20 minutes being lost in a building I’ve been in hundreds of times. I deserve a medal. If not for bravery then for stupidity or lack of any sense of direction at all. I get to spend today at the airport, which I absolutely adore. I don’t know why, but just the thought of visiting the airport gets me excited – even if it’s not resulting in a holiday. When I was younger, about 2 hours before we left for the airport to go on holiday, my teeth would start chattering out of excitement. Yeah, I was a weird kid. Not much has changed. I love starting Friday mornings with a fun breakfast. Weekday breakfasts are best when they’re simple to prepare, quick to cook and portable to eat. 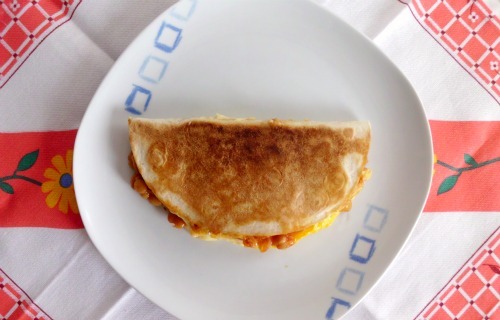 This Simple Breakfast Quesadilla ticks all those boxes, but if you’re planning to eat it on the go, you might want to watch for the melted cheese dripping on your freshly-washed work shirt. Believe me – I know. 1. Fry the egg in a pan the way you like it. 2. Heat the tortilla in the microwave for about 30 seconds or until it’s soft. 3. Heat the baked beans in the microwave for 1 minute or until cooked. 4. 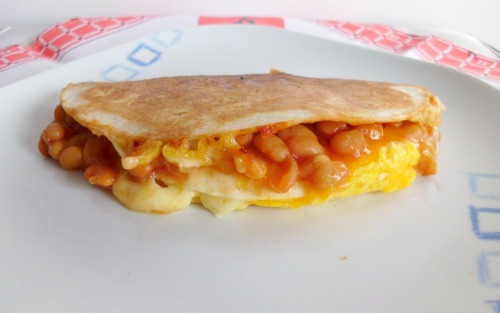 Place the tortilla on a plate and layer one side with the egg, beans and cheese. Fold the blank half of the tortilla over the filled half and place back in the frying pan over a medium-low heat for a couple of minutes until crunchy and golden brown. Flip the tortilla over and cook for another minute until the other side is cooked through.